Prey begins by introducing David Williams. His wife has left him and moved to Durham with “Raymond the bearded fart”, leaving David with their young son Danny. After the break-up David goes to pieces a little—wouldn’t anyone if their wife ran off with a bearded fart? And his interior design business quickly follows his marriage down the drain. Then David gets offered a job fixing up an old house on the Isle of White. When he and Danny move into the house, though, David finds that there is a lot more than just a few burst radiators and some dry rot to contend with. There are unusual scratching noises in the walls and something very strange indeed up in the attic—something that sounds far too big to be just a rat. Then there are the white faces that appear at the window, the man in the tall black hat, and a girl with worms in her hair. Perhaps it is safe to say that there are some things at Fortyfoot house that David might never be able to fix. Prey is 352 pages long and is a haunted house tale with a difference—there is a little more behind the things that go bump (or scratch) in the night than just a common-all-garden ghost or two. Time travel comes into the story, as do a few creatures that H. P. Lovercraft would have been proud to call his own. There is also a witch with a cockney accent and a terrible thirst for evil. Prey has a little bit of everything and something for everyone. It’s not all about evil beings and an evil house though. It is also the story of a man learning to move on with his life after the break-up of his relationship, and about his love for his son. A little romance is added into the mix in the form of a girl called Liz, a would-be squatter who becomes David and Danny’s house guest, and just happens to cook a mean chilli-con-carne as well. 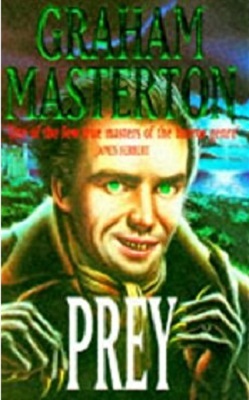 I loved reading Prey. In fact, I have read it twice now and it was just as good the second time around. Prey is one of my all time favourite horror novels. The characters are believable and one of them—Brown Jenkin— is easily one of the scariest creatures that I have ever encountered on the printed page. From beginning to end this is a great book and I can wholeheartedly recommend it to anyone who enjoys a book that provides the reader with an escalating amount of goose bumps with each turn of the page.